2. How many of this set would you purchase? 5 or more - I'll build my own cavalry! 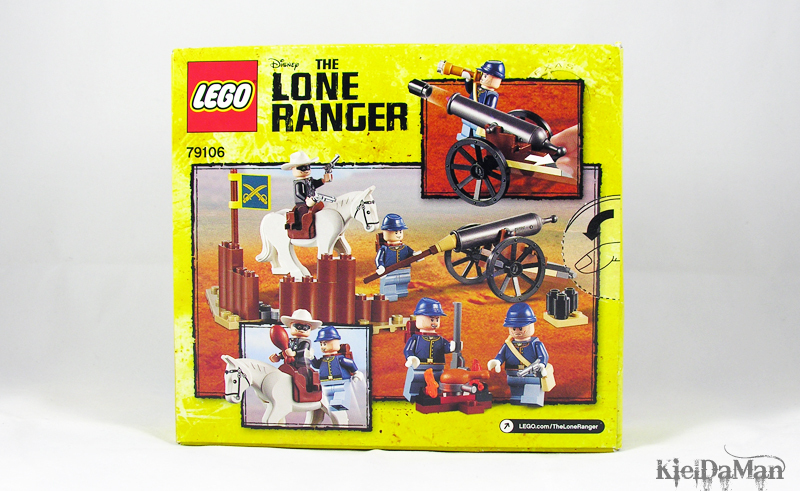 The image of the whole set may be cramped in the limited space afforded by the small size of the box, but the elements are nicely presented in the standard TLG way: highlighting the main feature (The Lone Ranger in his signature riding pose with Silver) with the supporting elements (cavalry soldiers aiming a gun and firing a cannon) and a now-becoming-more-common (unintentional?) funny bit (one soldier busy grilling his turkey drumstick while there is an on-going skirmish). The layout of the set features at the back seems to be well thought-of as the two separate panels (cannon and ‘turkey leg’) coincide with the position of the respective items in the main image. And the funny bit about the turkey leg continues at the back as Lone Ranger grabs away the poor soldier’s meal! 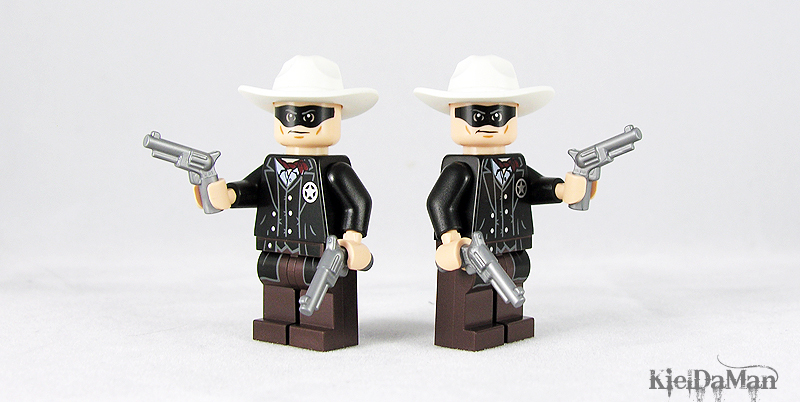 Like most small sets, the 1:1 actual size panel at the top shows a LEGO part rather than a minifigure – in this case the new revolver piece. 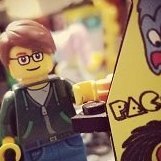 Have you ever wondered if the size of the part/minifig in this panel is actually 1:1 with the real thing? I did, and a side-by-side comparison reveals a slight difference in size! (though not really that important ). I overlooked this detail in my Stagecoach review but on the right side of the box there is a small logo which, thanks to my limited movie knowledge, I recognized right away as that “lightning strikes the tree” logo of Jerry Bruckheimer films (which obviously this Lone Ranger movie is also). 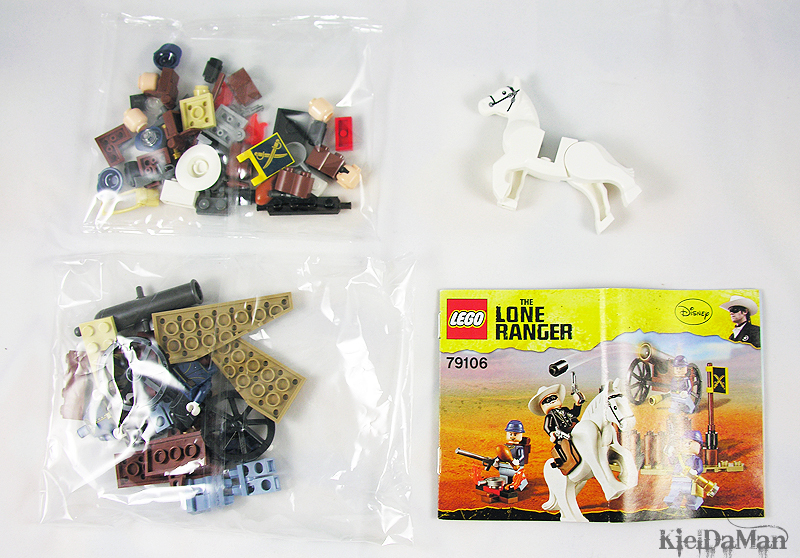 This little set gives us two small unnumbered bags of LEGO, a small (folded) instruction booklet, and the white horse piece that comes loose (my assumption is a large piece like this may be ‘problematic’ in the automated packaging in small plastic bags). Also, no sicker sheet! Yay! Since the coverart of the booklet is just the same as the one in the boxart, I’ll just highlight the faint background details of the pages which really give the pages a Wild West flavor consistent with the set theme. 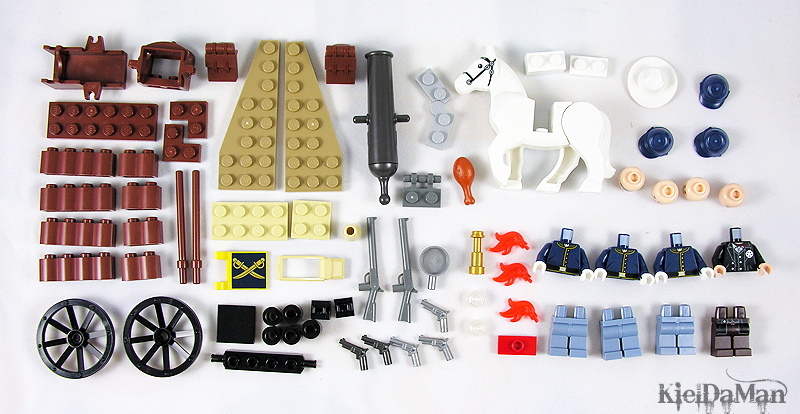 As a minifig-centric set, roughly a third of the parts are expectedly for the minifigs and accessories. The new white horse piece conspicuously stands out in the sea of Wild Western wooden brown, sand tan, and the usual black and grey assortment of parts. The new parts that come with this set are the white horse (first in this color) and the aforementioned new revolver pieces (in flat silver and pearl dark grey). When I first saw these new revolvers back in the preliminary pictures I felt there wasn’t really a need to make new mold since the old one would’ve worked IMO, but now I think these new revolvers add more authenticity/realism to this licensed theme. There is also a flag piece with printed, not stickered, logo of the cavalry, which is based on the real-life mid-19th century 7th Cavalry Regiment of the United States. For a small 69-piece, 13-buck set we get a generous amount of four minifigures: the star of the movie, the Lone Ranger, and the main “army-builders” of the set - three cavalry soldiers. 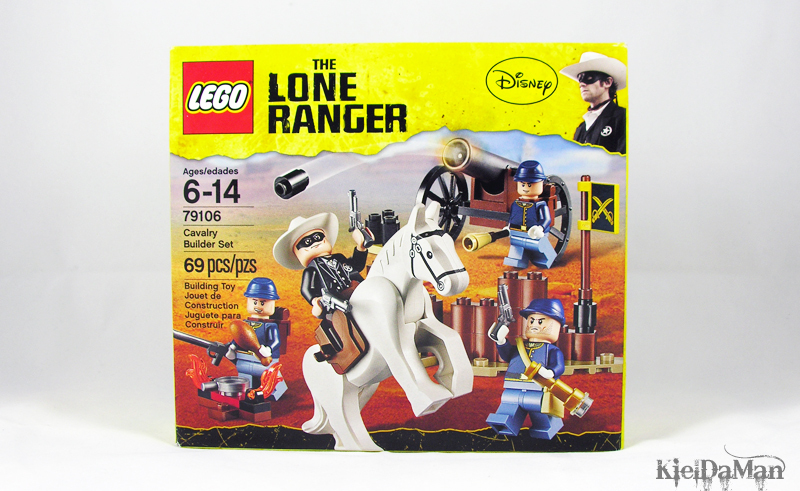 The Lone Ranger minifig is the same as the one in the Stagecoach set (and probably with the rest of products). TLG pretty much nailed the overlook look of LR in this minifig – from the face (except for the unshaven look of the actual movie character) to the outfit with his signature cowboy hat, black coat, and star badge. Meanwhile, the cavalry soldiers have the same blue cavalry uniform torsos, unprinted light blue legs, and blue forage caps but are differentiated with unique head prints and different accessories. One seems to be sort of a leader, carrying a revolver, a hand telescope and a duffel bag, while the other two are generic soldiers with backpacks and armed with rifles. All minifigs have back-printing which is already the norm nowadays. However, they don’t have double-sided heads. While it would’ve been nice to get alternative facial expressions, I guess it’s too much to ask for a small and cheap set as this one. (Double-sided faces aren't applicable with these minifigs since the back of the heads aren't covered enough! - thanks to Darth Lurtz for the correction). No you’re not seeing double, I'm just showing that the Lone Ranger from this set is the same as the one in the Stagecoach set. I think this is the only minor drawback of this set in the sense that you’ll end up with more than one Lone Ranger minifgure if you purchase the sets from this theme (just like Jack Sparrow in POTC, Aragorn in LOTR, R2-D2 in SW, etc.). 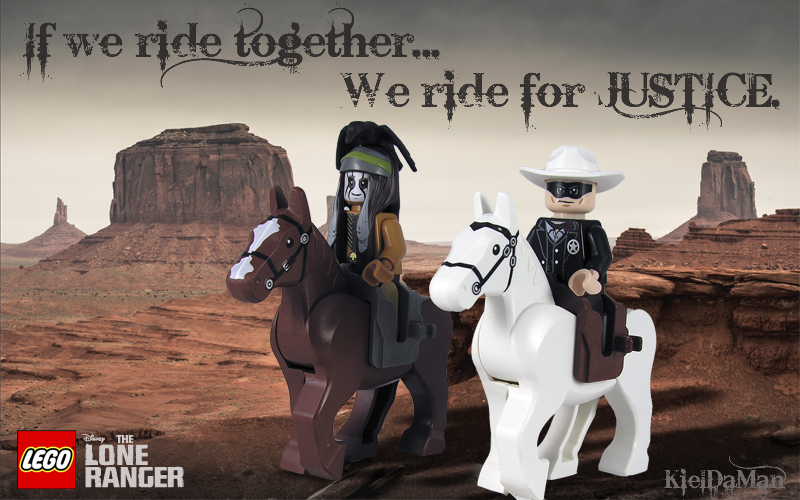 On the other hand, the inclusion of this minifigure in this set is understandable from the perspective that the Lone Ranger is the main character of the movie/theme and this is a good cheap way of getting LR together with Silver. I like the variety of the facial expressions of the soldiers – a cocky Han Solo-ish smirk, an angry serious boss-like look, and a confident smiling smug. I’m pretty sure these will be quite useful in fleshie-based minifig customization. 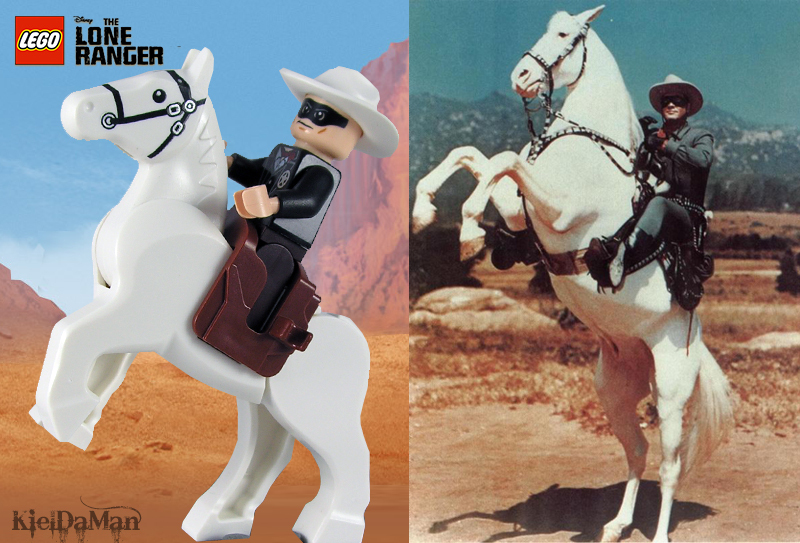 Since the Lone Ranger’s majestic white stallion is also a significant part of the Lone Ranger theme, he should also be highlighted with the other characters of this set. As previously mentioned, this is the first set to give us this new horse mold in white. I’m pretty sure this will also become popular with another licensed theme’s fanbase – I can now imagine LOTR fans removing the headstrap prints on this horse so they will Shadowfax. Here’s a group shot of the new horses in the three main colors. They look good together don’t they? And you can get these three (actually four, with another black one) from just two sets, 79106 and 79108, from this theme! The smallest build is a simple 11-piece campfire with a turkey leg being cooked as dinner for the soldiers. One begs to ask, how in the Wild West will one turkey leg feed three hungry men’s stomachs? Your guess is as good as mine. Despite the simplicity of the build I think this is a nice little feature capturing one aspect of “outdoor life in the wild”. The cavalry’s main assault weapon, the moveable wheeled cannon is equipped with four cannon balls round bricks and a handy rammer. The cannon, of course, is a must-have for any cavalry arsenal, so I’m happy the designers made the right call of including this in the set. 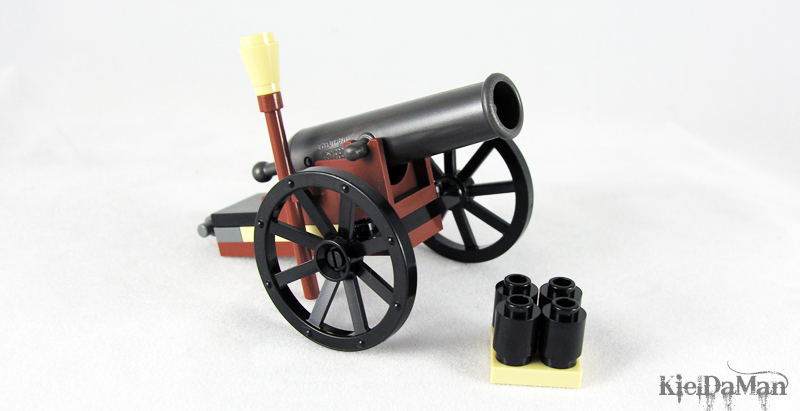 Personally, I have always loved LEGO cannons, I think this is one of the ingenious pieces TLG ever invented and I’ve been a fan of this piece/assembly since the classic Pirates sets. Getting another one in this set is certainly most welcome! Here we have the cavalry unit prepping the cannon, with one acting as the “spotter”, one as the loader of the cannon balls, and one as the “triggerman”. This is the first time I’ve seen the rammer accessory included in a cannon and I think it’s a quite accurate detail reminiscent of “early war technology” (or lack thereof) back then . Also, it’s good to know one of the spare flame pieces can be used in this scene to fire-up the cannon. We get a nice little barricade as defense of the cavalry unit during gunfight. 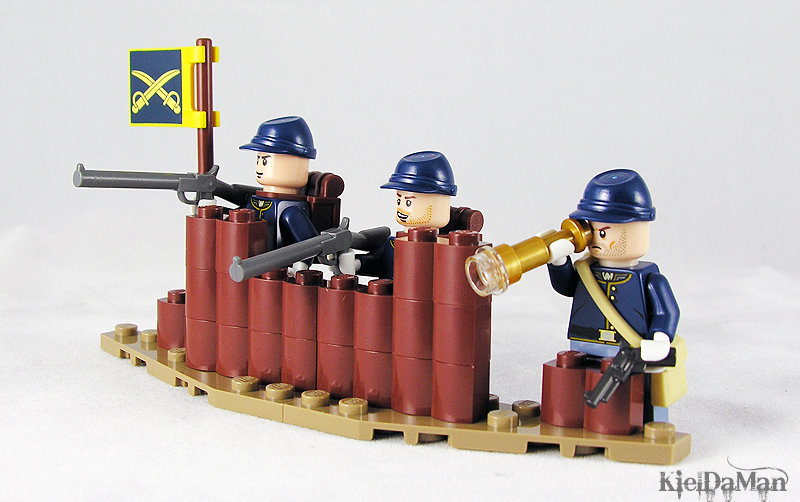 The ‘wood bricks’ appropriately give the barricade an Old West wooden look, and the small Cavalry flag is a sign that this mini-fort is officially sanctioned by the United States Army. Thanks to a swivel plate connector, the mini-barricade can be positioned in various ways/angles – straight (previous example), angled (left), or perpendicular/right-angled (right). Here’s a shot of the cavalry soldiers behind the barricade. The varying height of the barricade is just perfect for the different uses of the cavalry: defense (three bricks high), offense (two-bricks high - enough height for proper mounting of rifles), though I have no idea how useful is the one-brick high part of the barricade. Depending how one views this set, the Lone Ranger with Silver is either the main or the supporting feature of this set. Either way, this duo in itself is already a great "hero role-playing” playable feature for the kids. It helps also that the new horse mold is now poseable, allowing Silver to assume various action poses: walking (normal position), galloping (stretched hind legs), or even make his signature standing position (pictured above). Here’s the whole set in all its glory. Not a bad collection of mini-builds and minifigs for an army-builder set isn’t it? This theme is quite generous in giving us these new revolvers as we get a couple of spares (further increasing the weaponry of this army builder set). Weapons = 5 x revolver (including spares), 2 x rifles, cannon! Even Silver can be used as a generic white horse – which is a must-have for any cavalry unit. 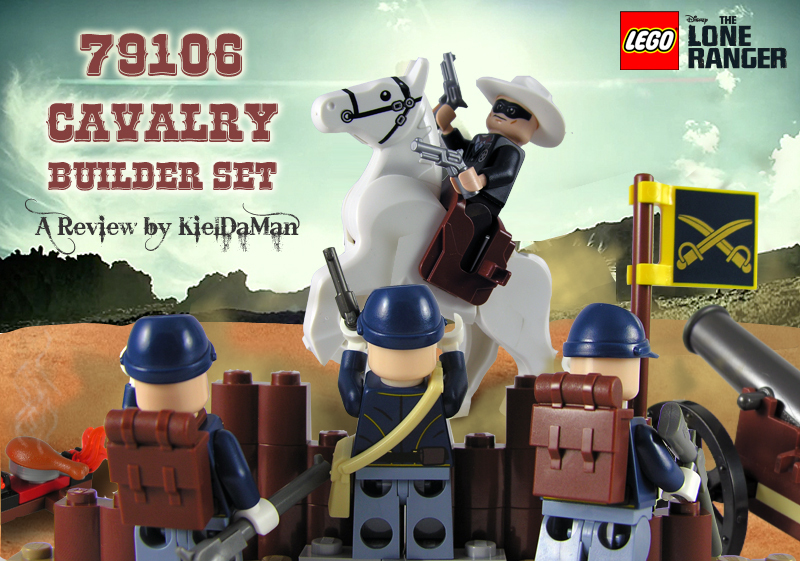 Overall, almost all the elements of this set (except for the Lone Ranger fig) are tailor-fitted for cavalry building. Just imagine the possibilities of acquiring several of these sets, you’d be able to build a substantial size of a cavalry: (e.g. 5 sets = 15 cavalry soldiers, 5 horses, 5 cannons, 25 revolvers, 10 rifles, a host of other accessories, and a larger barricade can be built from the parts), just never mind the 5 Lone Rangers you’ll end up getting. Needless to say, this is a definite must-have for any Old West Cavalry builder (though I have no idea how large this portion of FOLs is). For the more casual fan like me, this is a pretty good valued-purchase as you’ll be able to get the main character of the movie, Lone Ranger, together with Silver, plus other elements in a relatively inexpensive set. One last thing, before I forget, this set is a nice throwback to the old Western set 6706 Frontier Patrol (for those who don’t know). Design – 9/10 The mini-builds may not be spectacular but they definitely serve their purpose as simple but well-built complementary elements to an army builder set that focuses on minifigs and accessories. When combined with multiples of this set, that is where the full potential of these builds will be realized, and that in itself speaks of how well-conceptualized and well-designed this set is. Build – 7/10 One wouldn’t really expect much in terms of building techniques in a minifig-centric army builder set. The build is as straightforward as it can be. 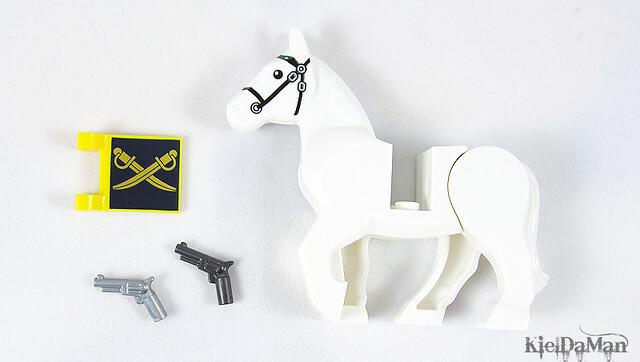 Parts – 9/10 The white horse alone garners this set a high score from me, considering this piece is still exclusive (at the moment) to this cheap set and the more expensive Constitution Train set. Plus points also for the printed flag! Minifigures – 9/10 Four minifigs in a 13-dollar set is a great deal, not to mention the variety in minifig heads and accessories we get for the cavalry soldiers. The simple but accurate representation of the real-life characters is also commendable. Playability – 8/10 Any set that has a cannon in it would translate to enjoyable time of aiming-firing-“looking-for-those-damn-cannon balls” especially for the kids. And cannons are definitely much better and more potent in knocking down minifigs than those flimsy flick-fires. Oh, and Lone Ranger riding Silver is in itself a good “hero role-playing” feature for the kids too. Price – 9/10 This set has prett good value especially when compared to similar army builders in Star Wars Battle packs: both have the same number of minifigs but you'll get better/more pieces, weapons, and accessories at a much cheaper price with this set. Once again, thanks for taking the time to read my review. Comments are certainly most welcome! Thanks for the review! One thing I have to disagree with though is about the double-sided faces. Their backs aren't obscured by hair or helmet pieces, so the faces on the back would be exposed if they were included. Ah yes you are absolutely right, how could I miss that unobscured back of the head detail (that's the same reason why LR doesn't have any double-sided face!). Thanks for the much-needed correction. Thanks for a great review, with excellent pictures! I am not into LR franchise at all, but this set is an excellent addition to any western collection so I will get it. Nice review! If I can't find the polybags I am definitely looking into this instead! It might be an error, but is there a reason you have the price listed as $19.99? Thanks for the excellent review (as usual!). I think that whoever designed this set really had AFOLs in mind. While the Cavalry soldiers come with 'fleshie' heads, the torso doesn't have any 'flesh' showing that I can see, and the hands are even wearing white gloves, so these can be quickly made into old school yellow headed wild west characters. That kind of design doesn't happen by accident, whoever made this set was thinking of western fans. While it is nice for those that can't stand flesh faces, I think it is just a coincidence. The original western theme had similar mini-figures and they had no exposed skin. Thanks for the review! 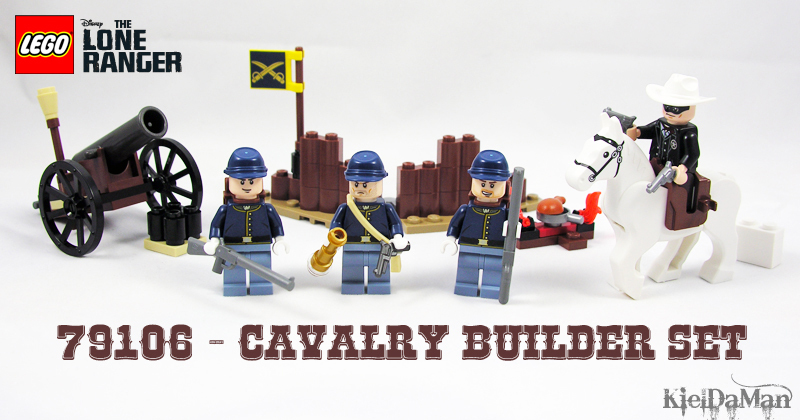 This set is great for building a US calvary. The white horse is also incredibly useful: both as Shadowfax and as Theoden's horse in RotK. One thing, though: you got the US price wrong. It's $12.99, not $19.99. No one would buy it at that price, not even me ! Excellent review, thanks a lot! Fantastic review KDM. Keep em' coming. Time to join the RA? This is a great way to get the new white horse or Silver for cheap, also for those interested in just the Lone Ranger fig. I am really not a fan of the cheekbones on any of the new licensed figs however. I agree this set is a solid 8/10. Great set for the price. Love the color pallette used in the Lone Ranger series. It might be an error, but is there a reason you have the price listed as $19.99. One thing, though: you got the US price wrong. It's $12.99, not $19.99. No one would buy it at that price, not even me ! Yep, it was just a typo, fixed it for 'ya. Thanks for the correction! This is a great way to get the new white horse or Silver for cheap, also for those interested in just the Lone Ranger fig. 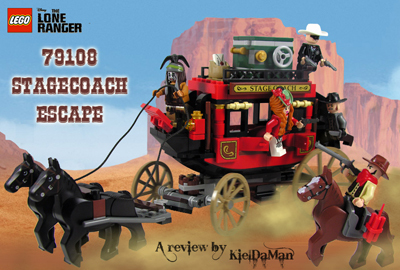 I agree this is a good set to try out this theme since you can get the Lone Ranger minifig and Silver in a small cheap set. The new white horse mold alone is worth the purchase IMO. Wow! Thanks for the great review! I'll be picking this one up. I think I'll just get this and the Stagecoach and I'll be good. Thanks for the great review! I have no interest in the set theme but might pick up this set for the white horse (to use with the Lord of the Rings line) and sell the rest. Great review! I was on the fence with this one, but I think you managed to convince me to pick it up! Nice review Kiel! Your photo editing is fantastic. This set really doesn't hold all that much for me. It is nice to see the resemblance to the old Calvary builder set. I have no interest in the set theme but might pick up this set for the white horse (to use with the Lord of the Rings line) and sell the rest. Thanks! It's a great-value set so it would be worth the purchase. Thanks Masked! Yeah I understand it seems Super Heroes sets are still the popular ones among the Licensed Themes but I guess the Lone Ranger product line will get its following from Wild Western fans or even casual fans like me. As small as the actual build is, I found it to be far from an insignificant, throwaway build. This set would have been far better with a 4th soldier instead of the LR, but it's well worth the price, esp. With the horse thrown in! I'm especially pleased that TLG opted to give the soldiers white gloves instead of flesh hands... It's easy enough ordering a few extra yellow heads from Pick A Brick, but converting to yellow is much more difficult with all these fleshie hands floating around. Thanks TLG! Wow! This set turned out even better than I hoped it would when I first heard the rumors late last year. It is interesting that you mentioned the Frontier patrol set, since I happen to have one that I bought brand-new back in 1997, and unfortunately, I only bought one. This set is essentially a beefed up version of that classic set, and THIS time I won't make the mistake of ONLY buying one (I'm getting at LEAST 3). As small as the actual build is, I found it to be far from an insignificant, throwaway build. This image illustrates the army building potential of this set (and I haven't even shown the remaining horses and cannons). Great review 'Kiel' and I guess that's the idea of this cavalry builder set so that you can build a small fort. 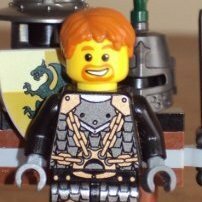 I wish Lego would stop twisting my arm......Brick On Review On 'Kiel' ! I have found a problem with the white horse in my set. It seems like every time I move it around, its head seemed to rattle. I compared this to the brown horses from my Lord of Rings sets and their heads were more fixed in place. Have anyone else come across this issue? I have found a problem with the white horse in my set. It seems like every time I move it around, its head seemed to rattle. I've got several of these sets, and I've noticed this with a couple of the horses. I just squeezed the "halves" of the horse together and it went away.